Lights, camera, egos… is it possible that the Oscar buzz around someone’s acting skills in movie could begin even while the movie is still shooting? OK…. but let’s just say that HAS happened — The media is rabid with rumours that working actress Marilyn Hack’s performance in the family drama “Home For Purim”, is Oscar worthy. What mayhem could that cause to the cohesive collaboration of a consummate cluster of cast and crew? Christopher Guest – and I’ve mentioned him in past reviews for his mocumentaries Best in Show, This is Spinal Tap and Waiting for Guffman, teams up with ensemble cast regular, Eugene Levy, to write this biting satire on fame, failure and fragility where the self image of the characters is the only thing shakier than the walls of the studio set in which they play out their stuff of dreams. This is definitely less mocumentary and more scripted drama, but there is still a great sense of semi improvised mayhem as much of the developing storyline plays out as interviews and hosted segments on a Hollywood gossip show. Fred Willard and Jane Lynch as Chuck and Cindy host tinsel towns most titillating tell tale infotainment treat – “Hollywood Now”. The depth of their shallowness is extreme. Their banter and behavior is barely even pushed one notch past pedestrian for us to “get it” and for them to make the point – why does commercial TV exist? To promote other things on commercial TV of course! And while regular updates from the media circus centre ring ensure our propaganda presenters purposefully push the possibility for that paragon of prizes, we also see more and more of the unfolding of the movie within the movie – “Home for Purim” – as the cast and crew continue filming. It’s a simple, touching, family drama set in the South in the 1940s… a dying mother, estranged adult daughter and a family truth that must be spoken… OK, its not Arthur Miller or Tennessee Williams exactly, ah, but it thinks it is. … and so on and so forth…. 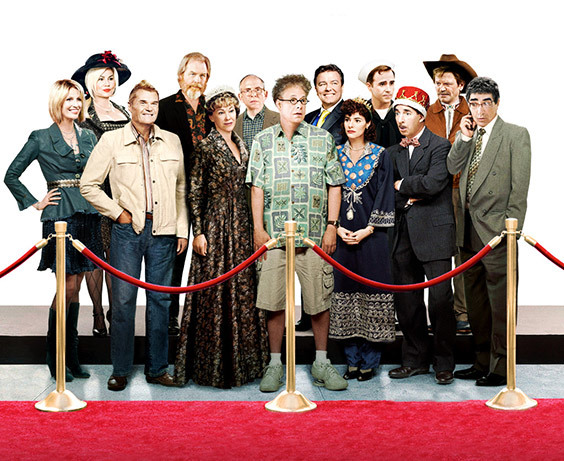 as well as a few special guest cameos including; Ricky Gervais, Richard Kind and Sandra Oh. Now, the people who make those infotainment sorts of shows do take their craft very seriously – some of them even think they are adding value to society. So, if you are poking fun at their world don’t expect a mention for your new thing on their TV show… but clearly Christopher Guest doesn’t care and probably realises his core audience are not the types of people who either watch shows like “Hollywood Now” or buy into the hype no matter how many TV commercial spots are given over to it. Like the seven discerning followers of these reviews, some folk just don’t take on board the bull not matter how it is served up. But with that attitude, did perhaps this mirthful mockery of movie land madness backfire a little? Earlier Christopher Guest mocumentaries were made on modest budgets, and likely made a modest profit, certainly “Best In Show” did, at least enough to justify another film a few years on, but if we can believe all we read on the inter-webs the budget here was around $12million… but it grossed only about $5million world wide… ouch! Now, the old rule of thumb – a film has to gross about three times its budget to break even… given distribution, publicity and other costs. So, by that measure, no one was planning an early retirement after this one. I hope he was meaning “Home For Purim” doing the break out. And I think Mr Long has recognised something that is under the skin here and also in Best in Show… Guest loves his characters. He recognises they are flawed, some of them reckless and selfish but some also shows signs of fragility. We saw it in the hunting dog owner, played by Guest himself, in “Best in Show” and here we see it in Marilyn Hack, and her ultimate buying into all the hype around her…. This self aware woman, fed a taste of the drug of desire, ends up hooked and… well, you’ll have to see the movie to see how that slide into delusion plays out. Catherine O’Hara, another long time Christopher Guest alumni, is wonderful as Marilyn and as the Jewish mother in “Home for Purim” where she delivers an outstanding fourth rate performance. Acting that bad can only come from someone who is actually really, really, good! And her transformation from slightly frumpy middle age to a reinvented self is both shocking and pitiable – some of that tender truth behind the laugh lines. OK. Cut, print, that’s a wrap! The “further information” links are correct at the time of publication. Newtown Flicks can not be responsible for dead links or content moved or deleted from other sites after the publication date of this review. The comments are those of the individual reviewer unless otherwise stated. Each review (spoken and written) is the property of the individual author of that review. All rights to the film under review, including related promotional elements (e.g. video clips, freeze frames, production stills, posters, box cover art, etc) or materials relating to the documentation of a film’s production (e.g. “on set” or “behind the scenes” photographs or interview comments from cast/crew), remains the exclusive property of the originators / legitimate owners of those elements. Those elements are reproduced with the intention of “fair use” for the express purpose of review / critique of the film. Newtown Flicks claims no ownership of this pre existing material and is diligent in ensuring the use is restricted to the relevant video review and related web site known as BETWEEN THE CRACKS.